A thrilling journey into the minds of African elephants as they struggle to survive. For years, young Mud and her family have roamed the high grasses, swamps, and deserts of the sub-Sahara. Now the earth is scorched by drought, and the mutilated bodies of family and friends lie scattered on the ground, shot down by ivory hunters. Nothing-not the once familiar terrain, or the age-old rhythms of life, or even memory itself-seems reliable anymore. Yet a slim prophecy of hope is passed on from water hole to water hole: the sacred white bone of legend will point the elephants toward the Safe Place. And so begins a quest through Africa's vast and perilous plains-until at last the survivors face a decisive trial of loyalty and courage. 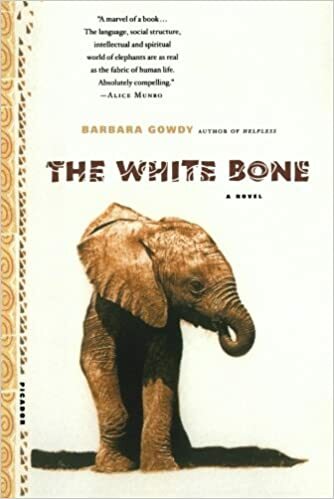 In The White Bone, Barbara Gowdy performs a feat of imagination virtually unparalleled in modern fiction. Plunged into an alien landscape, we orient ourselves in elephant time, elephant space, elephant consciousness and begin to feel, as Gowdy puts it, "what it would be like to be that big and gentle, to be that imperiled, and to have that prodigious memory."